The Albion Lancaster sword is named for one of two rival houses (Lancaster and York) that fought during the 15th century English Wars of the Roses. The wars are so called because of the heraldic badges of the two houses – a red rose for House Lancaster and a white rose for House York. Though the two houses both descended from the House of Plantagenet, which had held the English throne since the 12th century, a dispute to the rightful heir of the throne had existed since the death of Edward III in 1377. Mounting discontent over the handling of the Hundred Year’s War, corruption in the royal court, and various failed military campaigns ultimately led to an outbreak of civil war when Richard, Duke of York, raised an army and marched on London in 1455. The conflict would continue in fits and starts until 1485, when the Lancastrian Earl of Richmond, Henry Tudor, defeated the Yorkist king Richard III at the Battle of Bosworth Field. Henry Tudor promptly married Elizabeth of York, merging the two houses and combining the red and white roses into the “Tudor Rose”. The ensuing Tudor dynasty would go on to rule England and Wales for over a century. Albion Swords’ Lancaster is an Oakeshott type XV arming sword, typical of the kind that would have seen use during the Wars of the Roses. By the mid 14th century, fully articulated plate armor offered excellent protection to those with the means to afford it. In order for a sword to defeat such armor, a narrow and robust point was necessary to thrust through the gaps between plates, and at weak points such as the neck and groin. However, as not all fighting men would be able to afford full plate, an effective sword needed to retain the ability to cut through weaker defenses in close quarters. Thus the hybrid type XV blades came into use, as their broad bases, sharply tapered points, and thick central spines struck a balance between cutting and thrusting capabilities. Eventually this blade design narrowed further and was combined with more protective swept and ring hilts to evolve into the side-swords of the Renaissance era. Albion’s Next Generation lineup of original, historically accurate reproductions has quickly become the standard for high-end western swords. Being a long time sword collector, I have wanted to get my hands on an Albion sword for some time. I was drawn to the Lancaster both for its aesthetics and because of the testaments to this sword in the few reviews available online; Lancaster owners often note the speed and superb handling of the weapon. Despite this positive feedback, the Albion Lancaster seems to be a somewhat underrepresented Next Generation model, and this further compelled me to get my hands on one to see for myself whether the sword lived up to the hype. 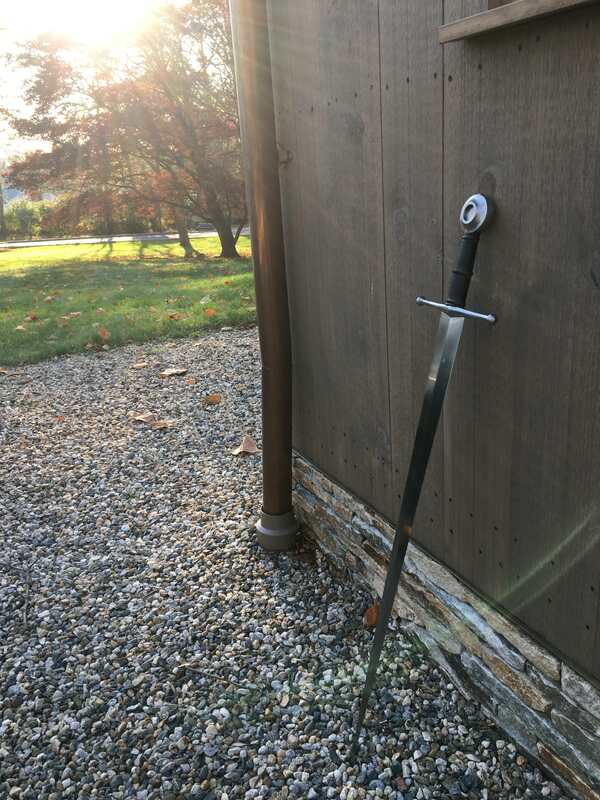 I purchased this sword from a forum user on this site, and it came to me in virtually unused condition. 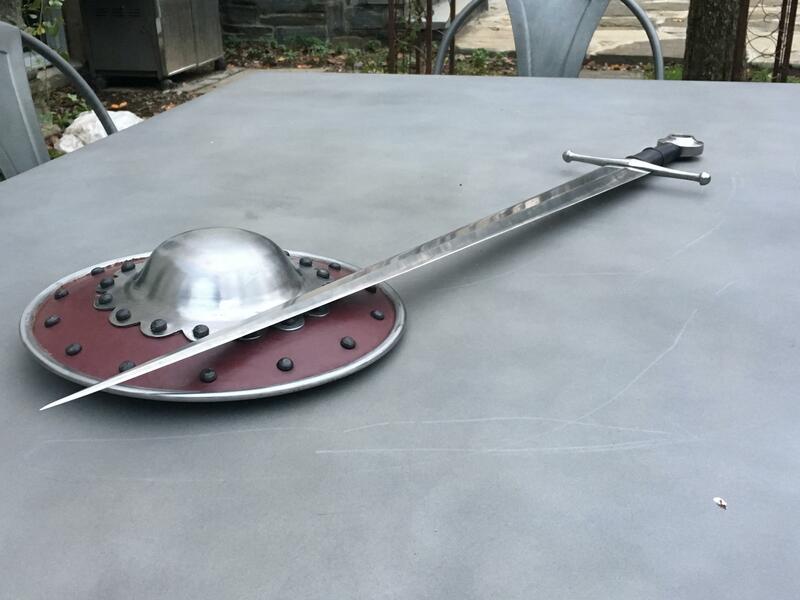 Reproduction made by Albion Swords of Wisconsin. This is where I expected the Lancaster to really shine—Albion’s website describes the sword as “eager to follow the intent of the swordsman”, and reviewers online frequently note the sword’s swift handling and excellent point control. Upon opening the box, I was surprised at how small the sword appeared. 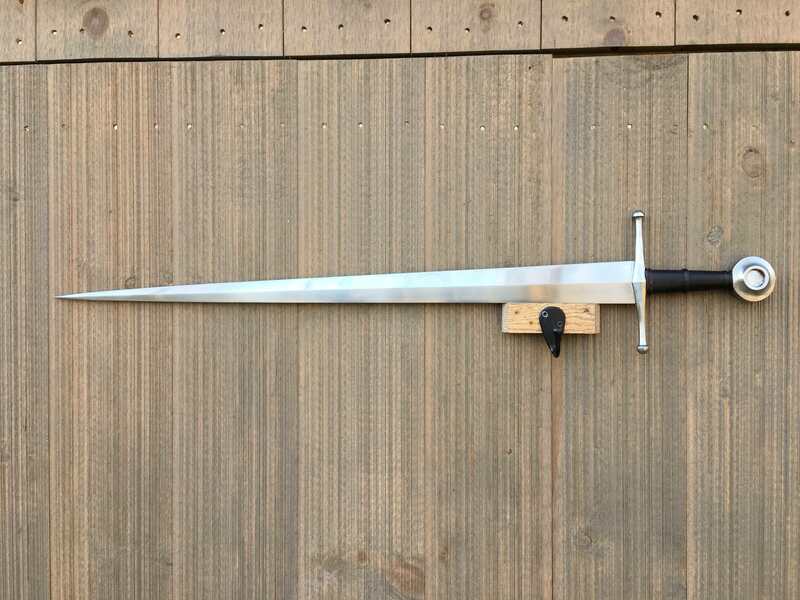 Then I removed the sword from the box: it became immediately clear that despite being a single handed arming sword, the Lancaster has significant blade presence. I noticed the characteristic of the sword wanting to “move on its own” that many Albion owners report. 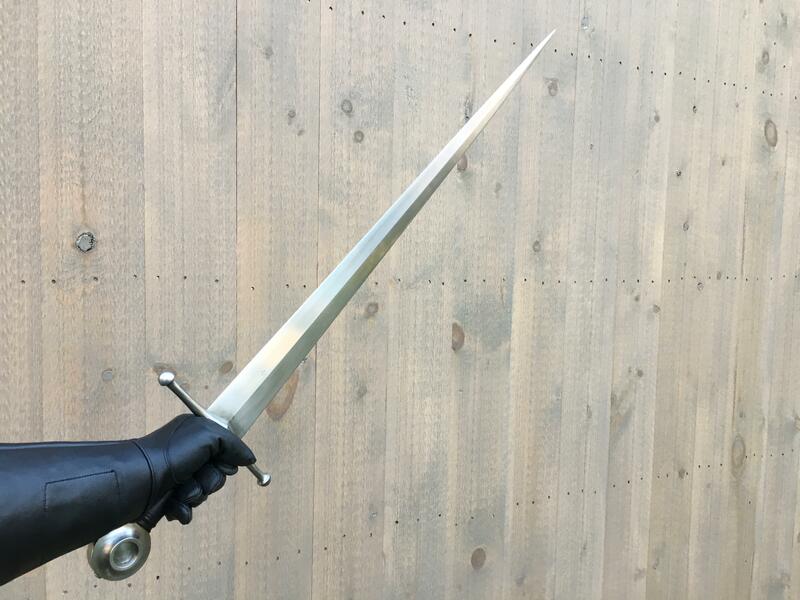 The Lancaster is extremely well balanced, with its weight concentrated slightly more towards the hilt than one would expect to find on other varieties of arming swords. This is due in part to the geometry of the type XV blade—a broad base and sharp taper results in more steel (and thus more weight) closer to the hilt. What I had read about the Lancaster’s handling is true, especially in terms of point control. Simply put, the point of the sword goes where it is aimed. It is even possible (and quite comfortable) to hold the sword with a fencing grip and thrust as one would with a modern foil or epee. As this is a cut-and-thrust blade, I wanted to test the sword’s ability to slice as well as thrust. Since receiving the Lancaster I have conducted several cutting sessions, using water bottles, pumpkins, gourds, and various fruits as targets. Cutting soft targets with the Lancaster is a blast. The sword is very fast both in the cut and recovery; this speed lends itself to taking thin slices off of soft targets. When I move my cuts closer to the hilt of the sword, the blade is capable of cleaving a full pumpkin in half effortlessly. Naturally, water bottles present slightly more of a challenge, requiring precise edge alignment and even more emphasis on cutting closer to the hilt. Here I believe the sharpness of the blade also comes into play – my Lancaster came with a well formed, if not razor sharp, apple seed edge. If my edge alignment is even slightly off, the sword will bat the water bottles off the target stand. However, keeping the edge true is not particularly difficult thanks to the handling characteristics of the Lancaster. During one cutting session, I missed with my cut and struck the sword against the wooden target stand – the edge took no damage. I have also tested the point of the sword by thrusting into various wooden targets, which again did not affect the blade at all. 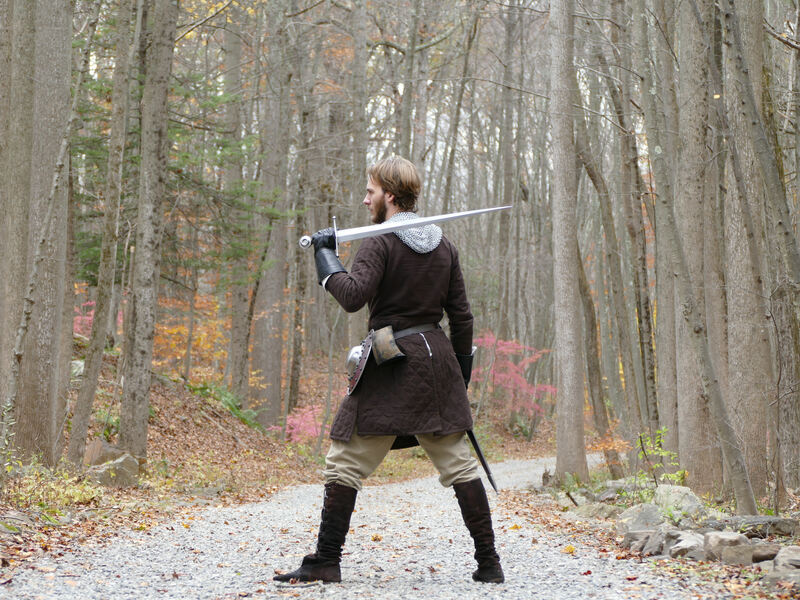 Because of the thick central spine, the Lancaster does not flex as readily as other medieval arming swords. This rigidity aids the weapon in the thrust. The fit and finish of the Albion Lancaster is on par with the rest of Albion’s Next Generation lineup I was immediately impressed with how solid the sword felt upon first handling it. The peened construction and use of high quality steel, wood, and leather amount to a design that is as structurally sound as it is historically accurate. The Lancaster is also an extremely aesthetically pleasing sword. 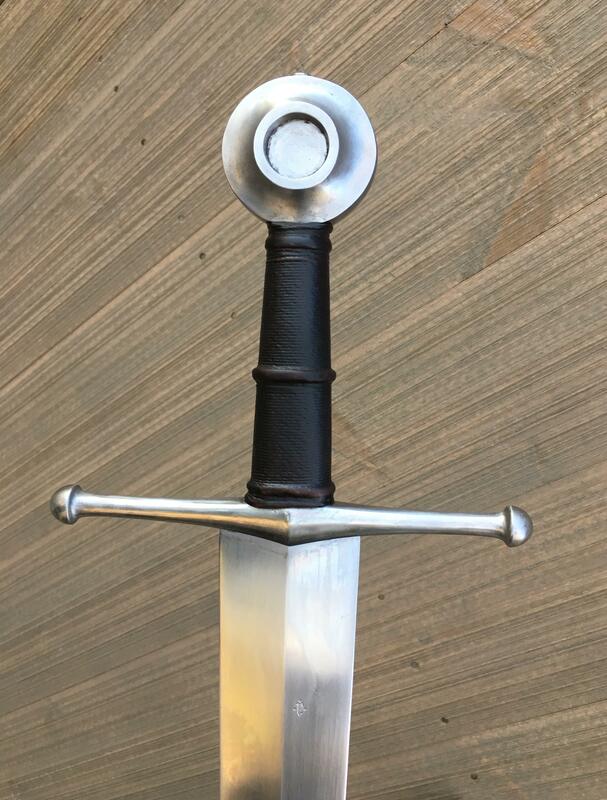 A compact hilt compliments the clean, simple lines of the blade, with subtle accents occurring in the flared quillons and the recessed center of the disc pommel. 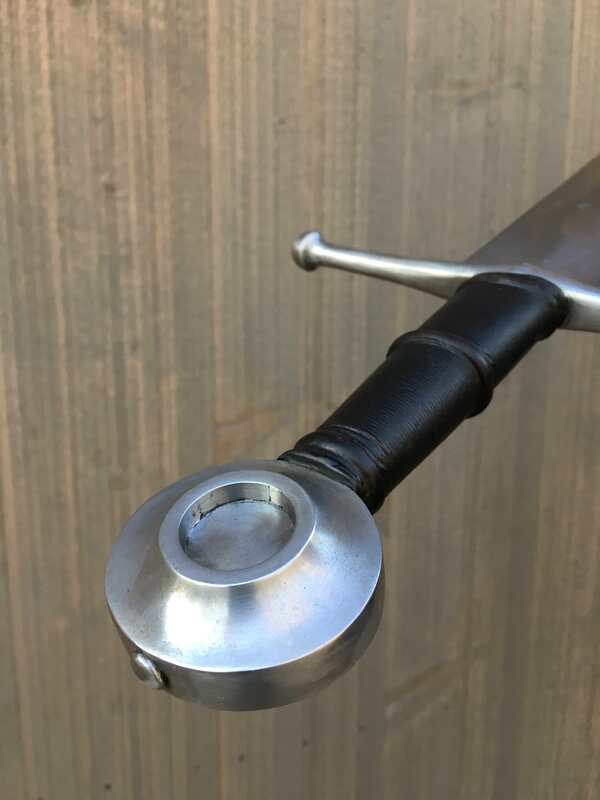 I will mention that after some test cutting and a good deal of dry handling, my Lancaster exhibited a clicking noise in the grip that seems to be a common issue among Albion swords. This is either due to a swelling of the wood resulting from humidity changes or the fact that some part of the wood grip did not bond to the tang when the sword was initially epoxied. It should be noted that this clicking has no effect on the function of the sword, however many sword owners (myself included) are picky about this sort of thing, and considering the price of an Albion sword, it is an issue that the company would do well to look in to. In my case, I dripped Hanwei sword oil down the gap between the blade and the guard and then rested the sword in a upright position (with the point facing the ceiling) overnight. The grip is completely tight again and the clicking noise has not returned since. UPDATE: This review was initially drafted in December of 2015. As of November of 2017, the sword has NOT exhibited the clicking noise and has held up to significant use without incident. The Albion Lancaster is a model in the Next Generation lineup that deserves more attention. The hybrid XV blade is not a specialist in either cutting or thrusting, rather, it balances these aspects to create a weapon that is truly versatile. The Lancaster is nimble and swift in handling, capable of very fast cuts and quick recovery. The thick central spine gives the sword a slight advantage in the thrust, and its superb point control makes thrusting through targets an effortless task. On 15th century battlefields, a sword such as this one would have been a frightfully effective close-quarters weapon, equally useful against opponents in full plate and those with light or no armor at all. 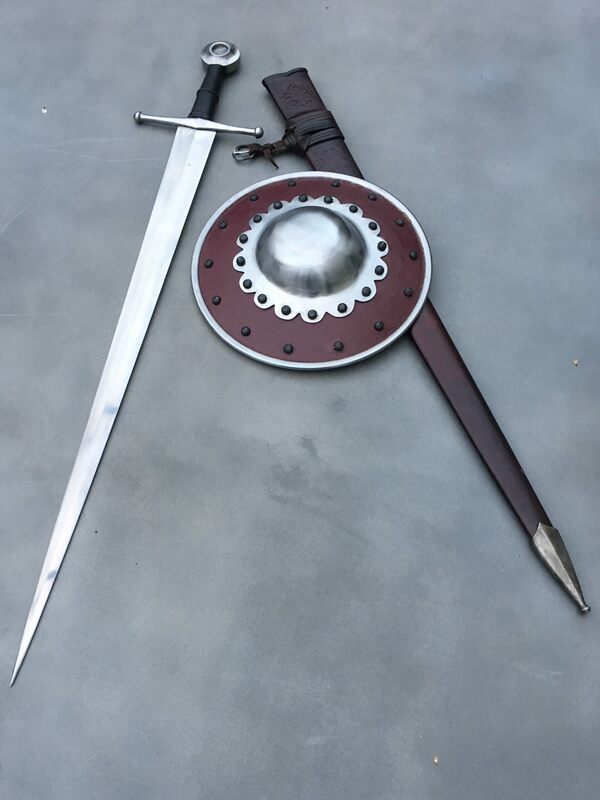 Personally, I am beginning my study of I.33, and I find this sword to be a viable alternative to the Oakeshott Type XIV blades that are commonly associated with sword and buckler practice. Albion has succeeded in creating a piece that will transport those with historically leaning imaginations back in time. The design is elegant, ergonomic, and simply beautiful, both to behold and use. It is no stretch to say that the Albion Lancaster is the finest sword that I own. Well written review with some beautiful pictures, I admit the type XV blades from Albion never caught my attention before but I think you may be responsible to adding another item to my ever growing want list. I love the arming sword / buckler combo, I have a Yeoman coming in a few months for that exact purpose, I always found bucklers very meh and boring until I started looking into how they were actually used and how elegant it actually is, and the Lancaster seems a perfect fit for it. Glad to hear you got rid of your clicking noise as well, as you say it does not affect functionality but if any of my blades started doing it I know it would bother me to no end. What a fantastic review! You've made me want this model, now. Thanks for the great review. I've always liked the look of that model, and it is good to read how highly functional it is. It looks like the perfect late 15th century sword. if I ever get another Albion, the Lancaster is very high on my list. Oh the Principe huh? Now I am truly jealous, it is currently on my top wanted list of Albions, minus the ones I have ordered, it's a stunner and from what I hear an extremely efficient cutter, bordering on cheating. As for a buckler I do have one, tho it is on the large side being 15 inches, I wouldn't mind getting a 12 inch as well, I have considered the same you have several times but I would have to redo the handle, they look too rounded and from what I understand a bucklers handle should be almost flat with the shield across the boss? I may be wrong in that, I love the appearance of it however so it is tempting. And yes time does indeed move differently, Albion time I call it, especially when you know that coveted shipping email should arrive any day, but hey what is one year of agony to years of gleeful flailing of steel. Thank you very much for the review Chip. I have looked at the Lancaster and this review does push me towards it as a future purchase. Great review! Nice pictures and I even though I don't have the clicking sound in any of my swords, I'll file that info away since it seems to be solid advice. The Lancaster is on of my favorite looking single-hand swords. Really appreciate this in depth review. Nice kit by the way. 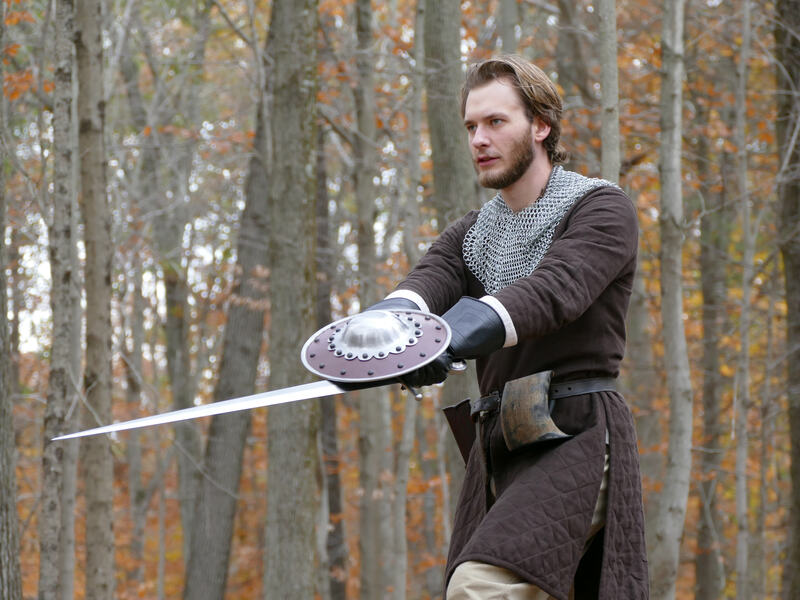 Who made the buckler and scabbard? The buckler I ordered from Kult of Athena - it’s the 12” scalloped buckler with the leather covering - certainly fits the color scheme of my kit. The scabbard was actually my own design that I had made by Sonny at Valiant Armory. There’s another post on this forum with close up photos - the Lancastrian rose is embossed on the throat. Sonny did a fantastic job - I cannot sing his praises enough. Thanks for the great review, Chip.I always appreciate a review that covers both the swords performance as well as the historical relevance of the design . I am lucky to have the "twin" of the Lancaster, The Poitiers. The two swords are remarkably similar in performance and specification,down to the P.o.B., so you might be interested to know that I also bought a Yeoman. My intention was to use the Yeoman to train I:33 and the Poitiers was purchased simply because I had no Type XV swords in my collection. You will likely not be surprised to hear that I now use BOTH swords to train with buckler in solo drills. I will also add that while they both work exceedingly well with the buckler, the Yeoman is a far superior cutting sword than the Poitiers, but the Poitiers is still a very capable cutter in ir's own right..
Truthfully, if I was somehow back in the day, hanging with Walpurgis, I would probably choose the Type XV Lancaster or Poitiers over the Yeoman. The XV is just a superior fighting weapon, IMHO. Congrats on the sword and Bravo on the review! Awesome review, and those pictures are incredible! I strongly considered ordering the Sovereign (with a steel pommel) as my next Albion before I went with the Principe. Ultimately I chose the latter for the simple reason that I’ve never owned a longsword. I agree that BOTH a type XIV and XV are useful for I:33 - they’re essentially two variations of cut and thrust swords, with the type XIV emphasizing the cut and the type XV specializing in the thrust. Cogratulations on owning the Poitiers - from what I’ve heard it’s a fantastic sword. I’ll admit I haven’t handled an XIV (regretably), but the more I practice with and use my Lancaster, the more I feel it is hands down the best close quarters fighting weapon I’ve ever handled or owned.